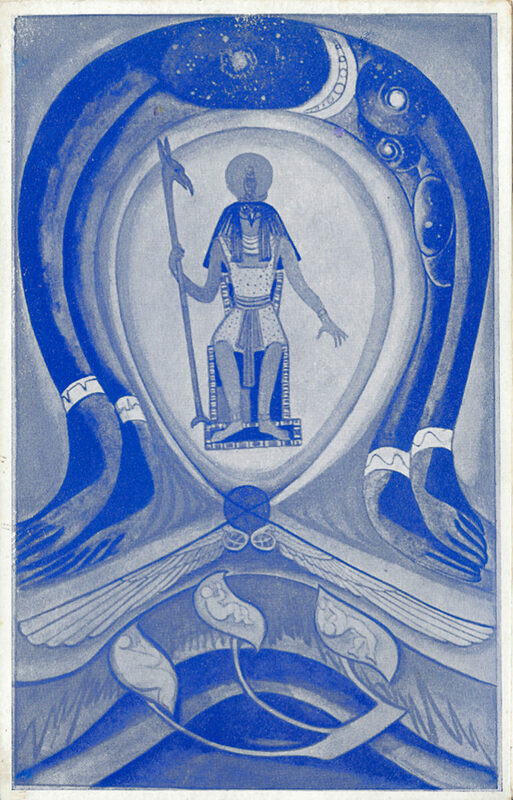 The First Edition: There were two versions of the first edition of Liber OZ issued. Both were printed by Apex Printing and identical in every way, save that one featured a picture of the Devil Atu, and the other, that of the Aeon. 300 in total were printed, 50 of the Devil and 250 of the Aeon. 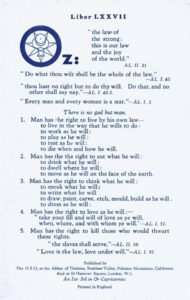 A single sheet of paper, printed on both sides and measuring 7½” × 4¾”. “Published by the O.T.O. at the Abbey of Thelema, Rainbow Valley, Palomar Mountains, California. And at Hanover Square, London, W.1. An Ixv Sol in 0° Capricornus” – Published on the 21st of December, 1941.